Lots of people use Kuala Lumpur as a first or last stop during their trip to Southeast Asia because it happens to be one of the cheapest locations to fly in and out of for national/international flights. This was actually the main reason we visited KL three times in the last 4 months. 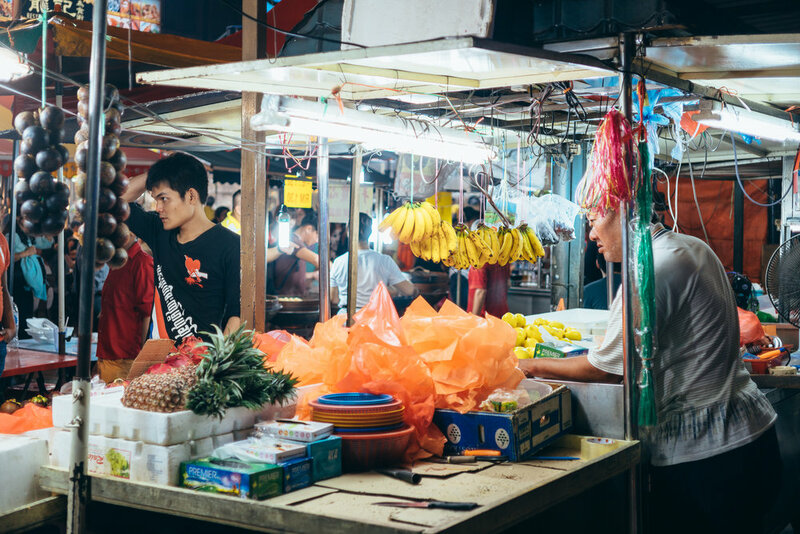 After visiting this city on more than one occasion, we really think that you should spend some time in Kuala Lumpur – not just because it's a convenient stop, but because it's a commonly underrated city among travelers. It's actually pretty amazing! Here's our itinerary of how to spend 2 days in Kuala Lumpur! Entrance of Batu Caves - 272 steps to go! The Batu Caves were the most impressive attraction we visited in Kuala Lumpur and you should not miss it! 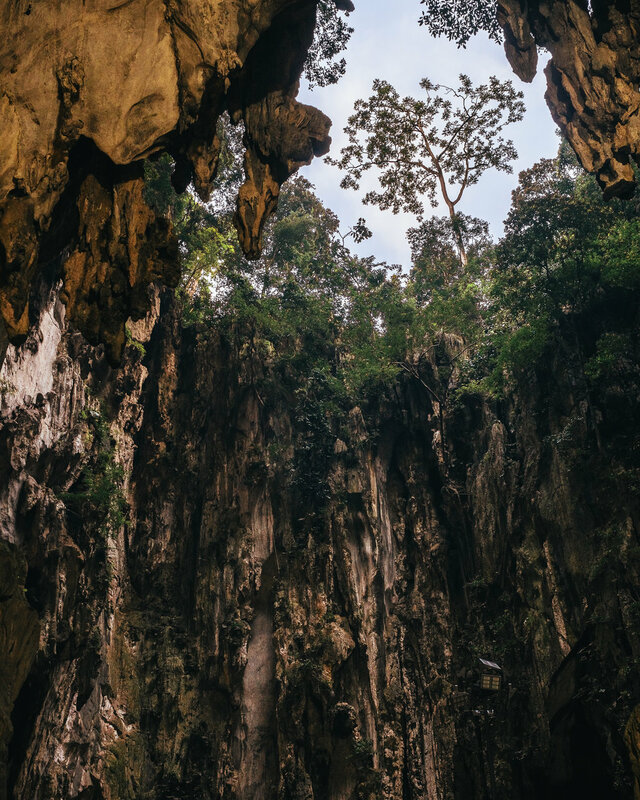 This huge limestone hill towers over you with a series of elevated caves and an accompanying Hindu temple that you'll be able to enjoy after the 272 steps that you'll have to climb to get to the top. Oh, and there are mischievious monkeys lining the entire path. The interior of Batu Caves. Monkey eating something that he (probably) stole. 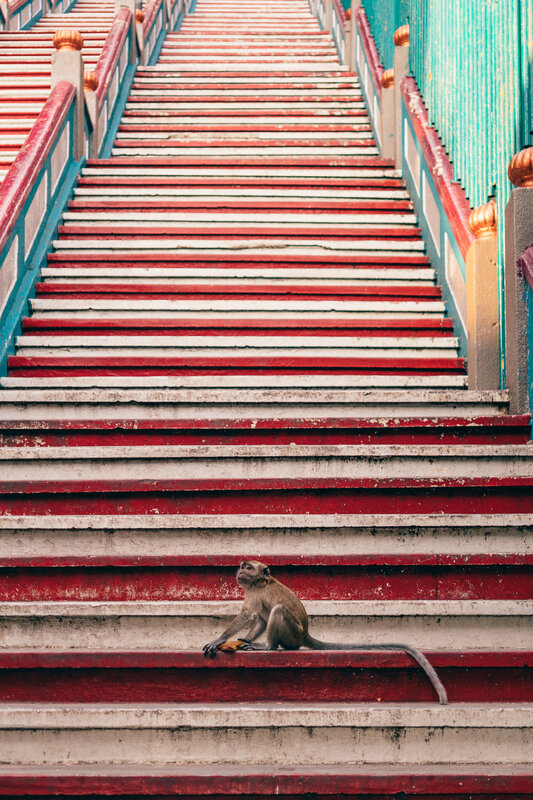 These monkeys are practically everywhere along the path, jumping and running around – so just be careful if you're carrying food or any other object hanging precariously off your body (sunglasses, for example), because these sly little monkeys will probably end up with it. Also, you're required to dress "appropriately" when visiting Batu Caves, which means shorts and tank tops are not permitted. If you don't have long pants, get a sarong! Sarongs are incredibly useful throughout Southeast Asia, and just traveling in general (something like this one should do the trick). Vibrant colours, lively Indian music, spicy food, and beautiful fabrics are just part of what this place has to offer. Little India is located in the Brickfields area in Kuala Lumpur, alongside a handful of the high rises that act as backdrops to this unique area. Just walking through and exploring KL's Little India is an enjoyable and worthwhile experience! About a 10-minute walk from the center of Little India, we found an Indian restaurant, "Mogul Mahal," that we just loved! The staff wasn't the nicest (maybe they weren't allowed to smile? ), but the food was delicious. And that's what matters in the end. This area is the perfect spot to stop for lunch when you’re back from Batu Caves! National Mosque. Unfortunately it was closed when we visited, as we didn't have the schedule beforehand! Built in 1965 as a representation of the independence of Malaysia, the National Mosque was designed with a mixture of several modern touches and Islamic influences. The mosque is impressively large, with a capacity that's able to host 15,000 people. This is a great place to learn a little bit more of Malaysia's Islamic culture, and the entrance is free. Also, If you're wearing casual, "inappropriate clothes," they'll loan you a tunic to cover yourself, for both men and women. Try to dress modestly this day, as it'll be helpful for both the National Mosque and the Batu Caves as well. Although we weren't able to visit, if you decide that want to do something else this afternoon, two really popular options just next to the National Mosque are the Perdana Botanical Gardens and National Museum of Malaysia. 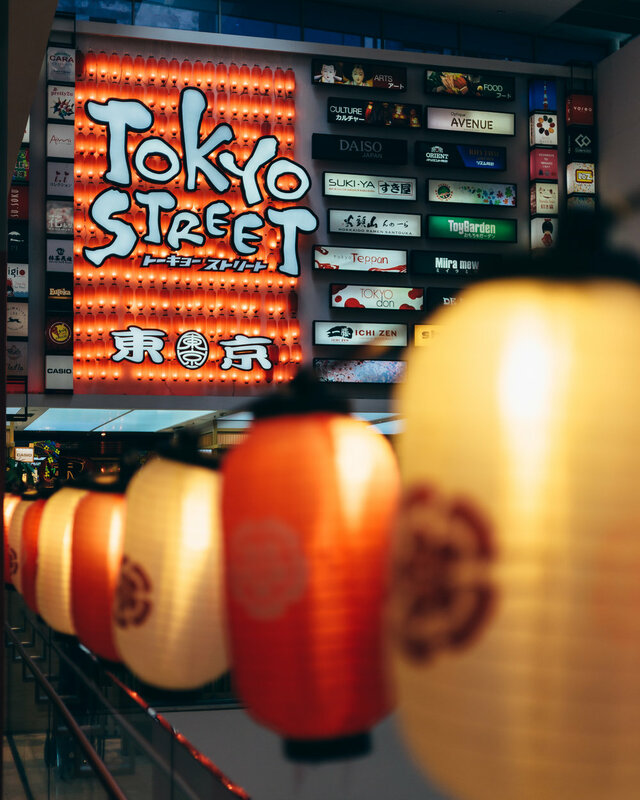 Within the area of Bukit Bintang, there is this huge street full of stalls and small local restaurants where you'll be able to try all kinds of local treats. We especially loved the coconut ice cream! Changkat Bukit during the end of the Ramadan. The road was closed off for people to walk through freely. 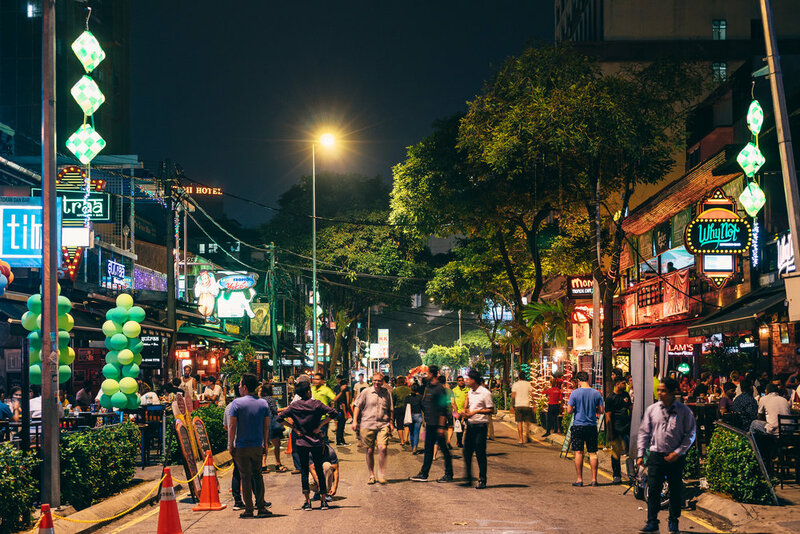 As an alternative to Alor Street, or as continuation of the night, you can check out Changkat Bukit, a venue that hosts several restaurants and clubs that party until late into the night. It's located a few minutes away from Alor Street. Merdeka Square, as seen from behind. Just in front of the Sultan Abdul Samad Building, surrounded by several colonial constructions, is Dataran Merdeka, or Merdeka Square. This is where Malaysians celebrate "Merdeka" (Independence Day) every year, and it's the area with the best-conserved heritage in KL. In front of Merdeka Square there is an enormous garden that hosts these celebrations each year. Although the typical photo is from that vantage point, this year the area was closed off due to the aforementioned celebrations. Central Market is a two-floor indoor market full of batik artworks, wood carvings, handmade products, local foods, and an abundance of colors and life. Luckily, it's only a five-minute walk from Merdeka Square. Also, next to this market you'll find Art Lane, a small street that's comprised of artist paintings and portraits. 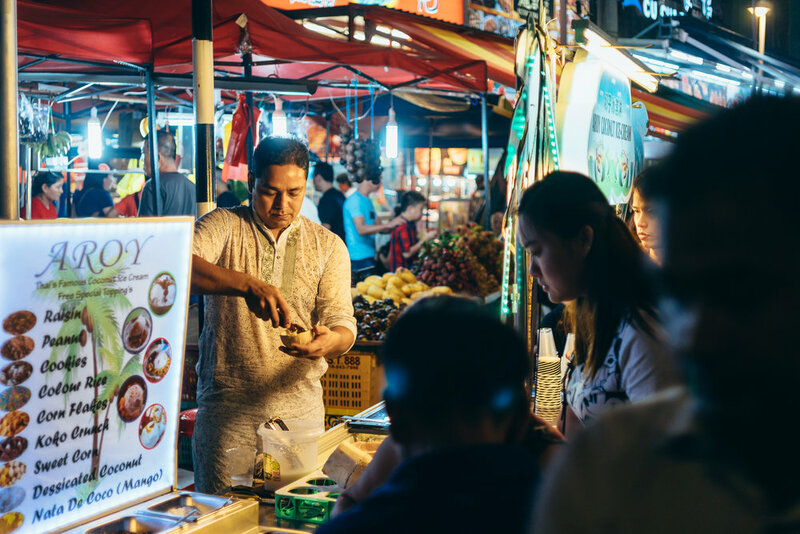 Then on the other side you'll find Kasturi Walk, an outdoor street made for pedestrians with several stalls of souvenirs and delicious foods everywhere. In any case, this whole area is worth a visit! 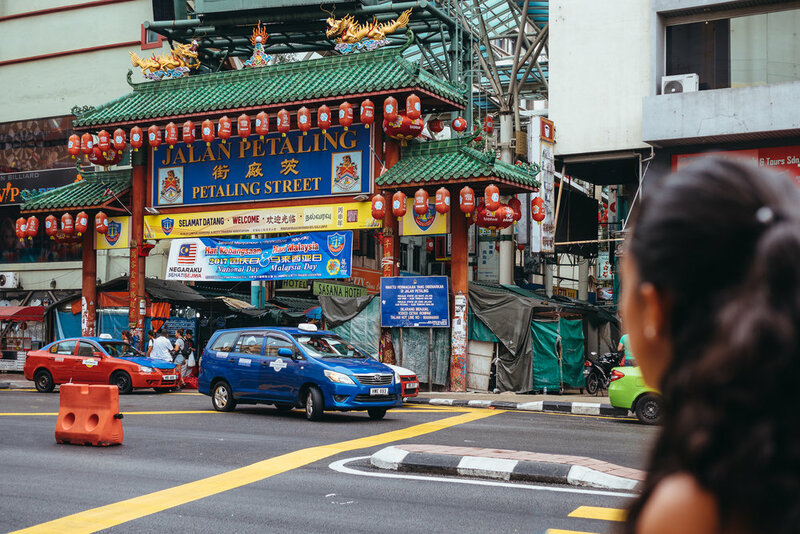 Petaling Street is in the heart of Chinatown. This is a flea market comprised of streets that are just filled with heaps of products replicating the most known brands on the planet (mostly clothing, clothing accessories, etc.). If you want absolutely anything from here, be ready to bargain! At the end of Petaling Street you'll be able to find some awesome street art! It's always a pleasant surprise to find street art like in this middle of nowhere. 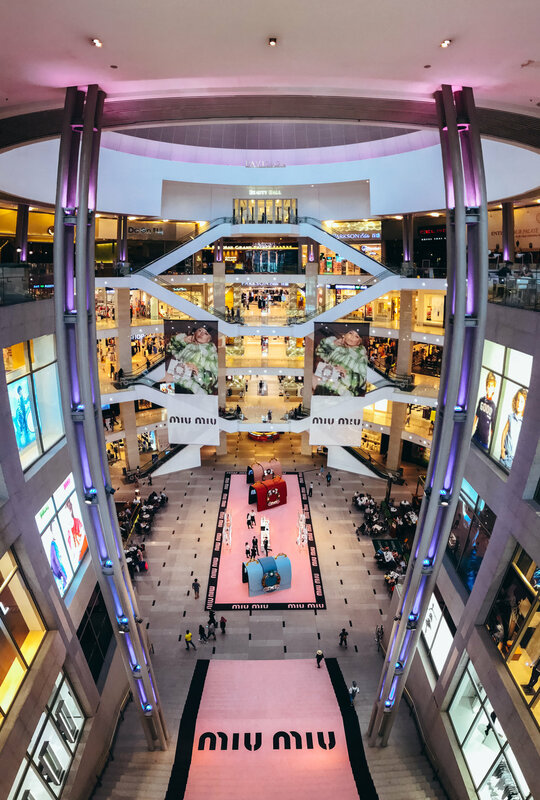 If you're into the shopping scene, this is definitely your place! Over 200 international shops and restaurants to dive in and lose track of time. If you're like us and aren't terribly interested in shopping (or can't, because budgets are important), there are several cool things to keep you interested without spending a dime. On our visit we really liked exploring a few different places, including: a brand new art gallery that had opened that weekend, as well as "Tokyo Street," an area dedicated to Japanese and Japanese-influenced products, and especially the enormous food court on the ground floor that features a wide variety of different food options. Petronas Towers, minus the hundreds of tourists and locals on the ground floor. Kuala Lumpur's landmark monument, the Twin Petronas Towers, is probably one of the most visited attractions in the city. We visited them twice to admire them in all their splendor, enjoying both the day and night view! You can admire them from down on the ground or up from one of the many rooftop locales in the city. One of the best ways to enjoy the ground view of the Petronas Towers is the simplest: chilling out at the nearby KKLC Park, where you'll see locals and tourists passing the time lying down on the grass, relaxing by the pool/fountain, and keeping fit by jogging or exercising. Despite its proximity to the bustling city, KKLC park, with its incredible views of the massive buildings that surround it, is a relaxing escape from it all. Once it's nighttime, there's a water-and-light show at the main fountain that's just at the feet of the Petronas Towers. Don't expect it to compare with other epic light shows, like Marina Bay's light show in Singapore or the one in The Venetian Hotels in Las Vegas – but it is still something that's worth admiring if you're passing by. Skybar, a rooftop bar on the 33rd floor of Trader's Hotel (situated just in front of Petronas Towers), is one of best ways to appreciate Kuala Lumpur from a bird's-eye view. The best time to visit is just before sunset; this will allow you to see how magnificent the sunsets at Kuala Lumpur are and how the city lights up at night. Sure, this may not be the cheapest way to view the city from up top, but think about it this way: instead of going up the Petronas Towers themselves, or Menara Tower – both of which require entrance fees – you take that money and use it to buy yourself a refreshing drink at Skybar while enjoying the otherwise free view. Besides the views and drinks, Skybar also has an indoor pool next to its seating area, as well as a daily drink specials and a variety of evening meals to choose from. The best part about it, especially for us, is that there is no entrance fee or strict dress code! Our favorite area to stay in was Brickfields, which is also located in Little India. Brickfields is just next to the KL Sentral Station, which is inside of NU Sentral Mall. This whole area is pretty convenient for moving around because it has some of the best connections with airports and is practically next to several different kinds of metros/trains (LRT, KMT, or KLIA Ekspres) as well as busses to move within and outside the city. You will also find plenty of local food (and lots of indian food of course! ), but at the same time will have access to other international foods. Plus, getting to shopping areas or the Petronas Towers only takes about 15 minutes with the metro! KLIA Airport is located about 1 hour away from the center of the city, and the best way to get there is by taking the coach bus for 12 ringgit ($2.85 USD), which takes you to the KL Sental Station we mentioned above. If you’re in a rush, you can take the KLIA Ekspres train, but it is much more expensive than the bus, at 55 ringgit ($13 USD). We only recommend using the train if it is really necessary, as the bus only takes an extra 30 minutes and is plenty comfortable. Over to you: Have you ever been to Kuala Lumpur? Was there anything you ?